Business contacts in the field of education can span a wide variety of industries, from government entities to nonprofit organizations and even farms. To reach leaders of this spread-out group of professionals, download this education program director mailing list today! Senior education administrators work in many different settings, but they all have a common goal: to convey knowledge or skills to others. A variety of tools can help make this happen, like computer equipment and optical mark-reading machines for managers of state education departments, art supplies for museum education program directors, or even things like carding combs or butter churns for educators who work on farms or at living history sites. Almost any product can have an educational purpose, and if that includes the product or service that your company offers, let education executives and managers of education services know with this education industry email database. 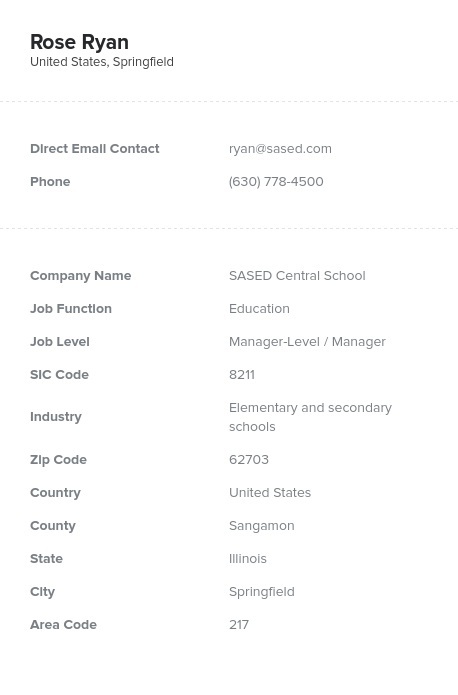 If you're targeting school districts and state education departments with your B2B marketing efforts, it's particularly crucial that you have an accurate education director mailing list, as institutions like these usually have a bidding process that you have to go through to make large-scale sales. That means that you need to be on their radar before they're considering a big purchase, and that's a lot easier when you reach out and connect with this affordable, accurate educational institution email list. Make sure that educator industry leaders learn about your business with this pre-built email marketing list of sales leads. Download it today!